Wow! 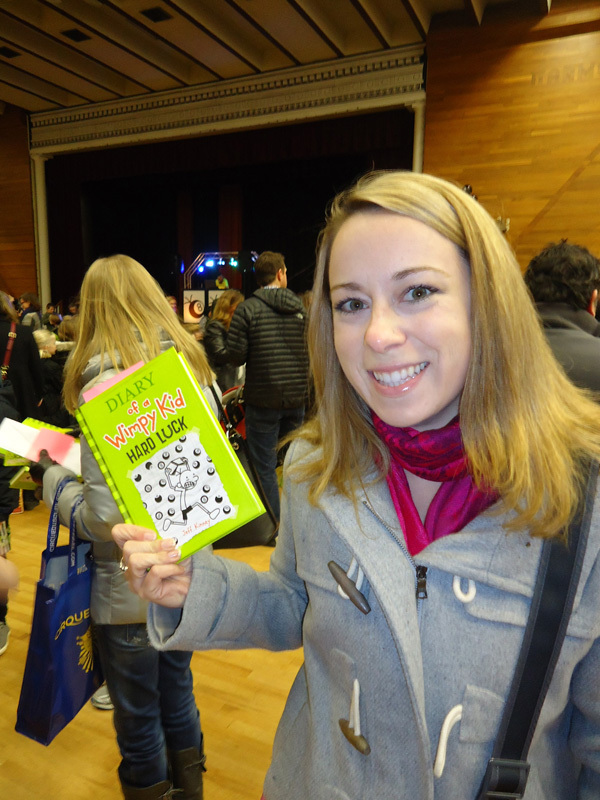 Last night Marcie and I went to the launch of the latest Diary of a Wimpy Kid book, Hard Luck. I’ve never been to a book launch quite like this one! 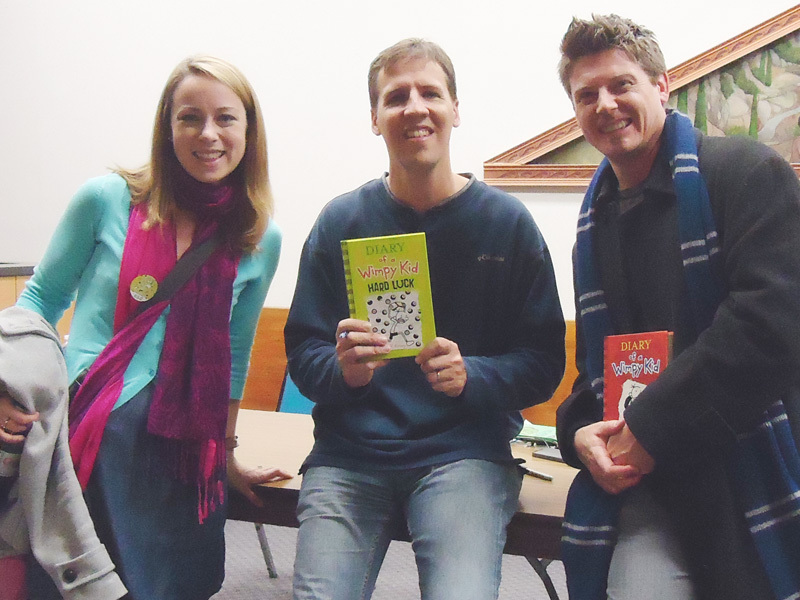 Author Jeff Kinney didn’t speak or present—he just signed, hour after hour. But he didn’t leave all his faithful fans to just fretfully stand in line. It was more like a carnival! 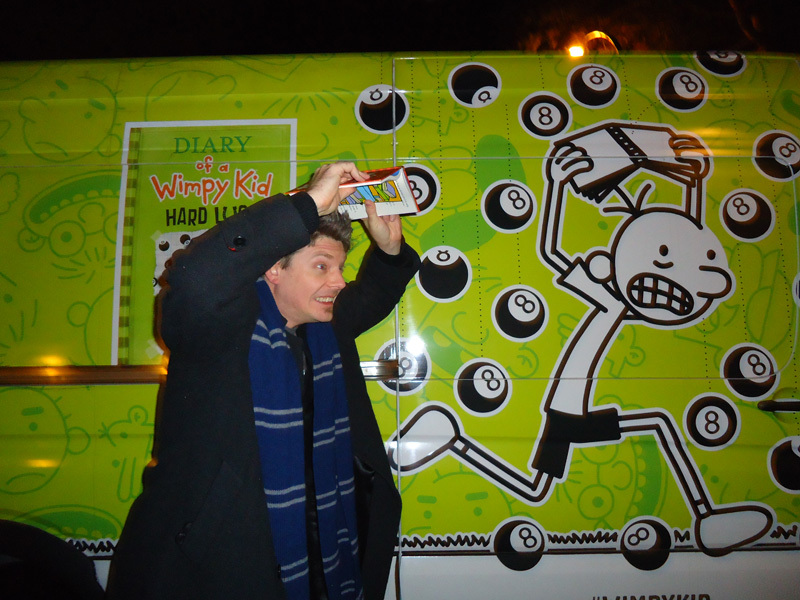 We first got a sense of what was happening when we approached the event site and saw a giant tour bus, all decked out with Wimpy Kid graphics. We should have taken a picture then, because by the time we left, the bus was gone. 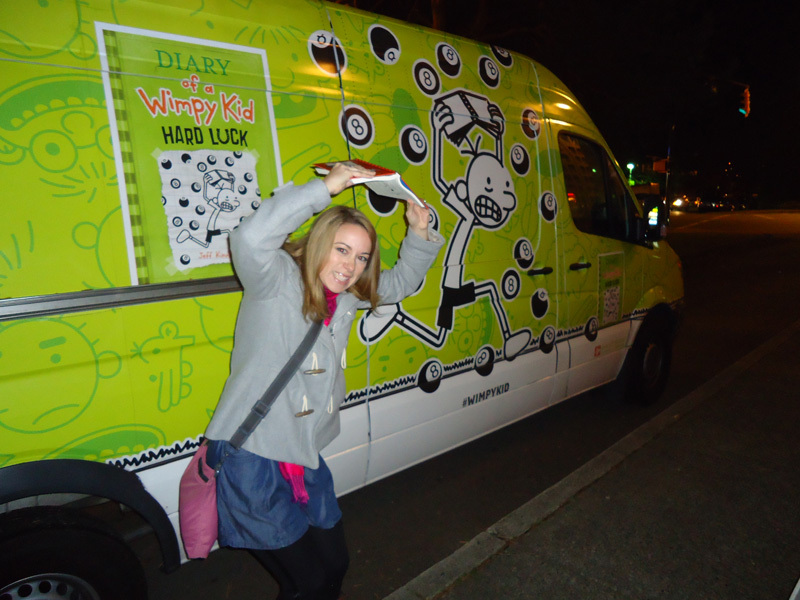 So we had to settle for photos of the Wimpy Kid van. Inside, it was a zoo. There were apparently 800 tickets sold, but I’m sure there was at least a thousand people there. There were all sorts of carnival-style games for the kids to play, as well as a Photo Booth, a fortune teller station, and a DJ who rocked the joint the whole night. 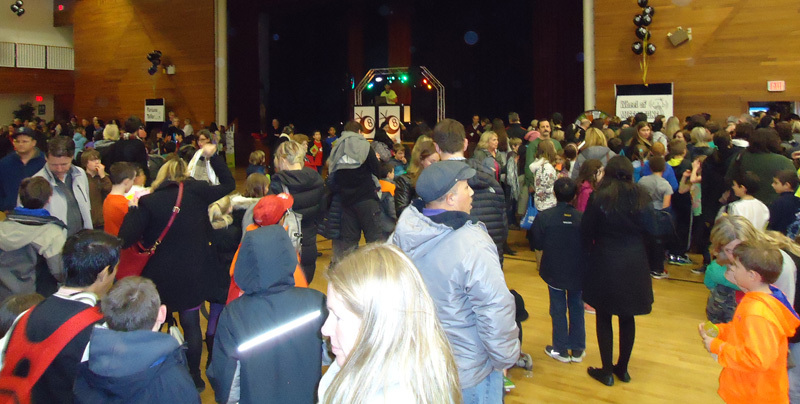 As the night wore on, and the kids started getting restless, the DJ started cranking the tunes and the floor turned into a mosh-pit of eight- to eleven-year-olds! I have to credit the crew; they started handing out free T-shirts to all the kids. When they ran out of shirts, the DJ gave the one off his back! By the time we met Mr. Kinney, we had been there for about two-and-a-half hours. I couldn’t believe he could still function. He graciously signed our books and gave us a moment of chit-chat. I was really impressed by everything and was pleased to experience this style of book launch. I had done something similar for my own last book launch (you can see the post and photos here), but of course I had only a hundred people or so at mine. 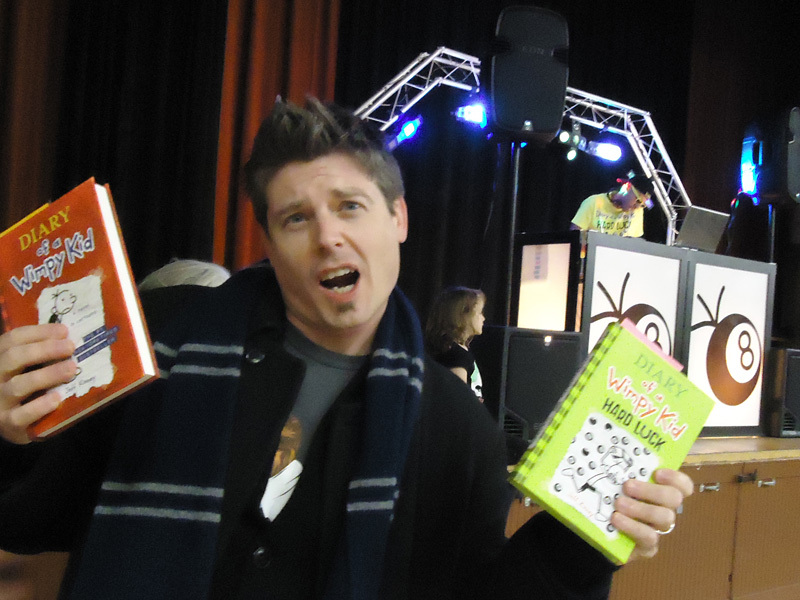 Still, I think this is what a launch of children’s book should be all about—a raucous celebration filled with games and activities all based on the books. So, here’s a big congratulations to Mr. Kinney and his team. You thrilled a lot of kids (and kids at heart) last night.